KATHMANDU, Nov 5: Nepal has met the requirements for 16 indicators out of 20 in the scorecard of the US Millennium Challenge Corporation (MCC) for fiscal year 2017, bolstering its prospect to be reselected for the funding of a compact program. The country scorecard of the MCC consolidates an individual country's scores for each of 20 policy indicators on three broad categories that the corporation uses to determine eligibility for its assistance funds. 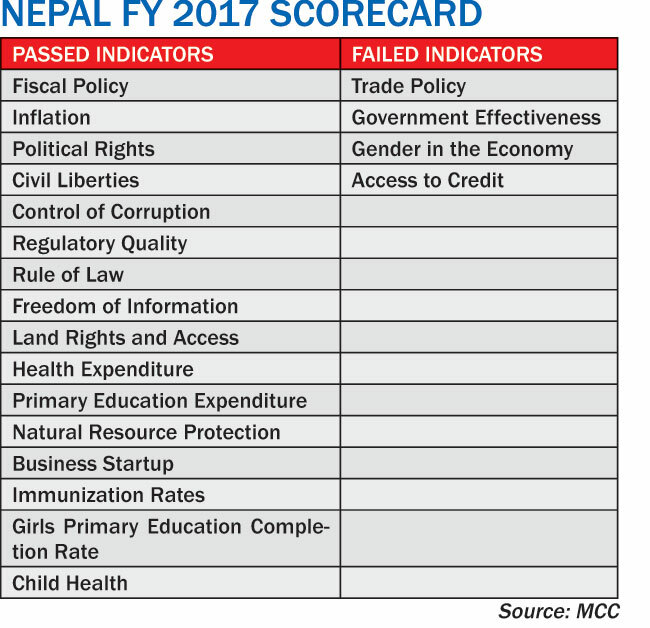 According to the 2017 scorecard of Nepal released on Thursday along with 81 other countries, 'Trade policy', 'Government Effectiveness', 'Gender in the Economy' and 'Access to Credit' are the four indicators where Nepal ended in the red territory in 2017 scorecard, implying that the country did not meet performance standard in those particular indicators. Earlier also, in the 2016 scoreboard, Nepal had passed 16 indicators. However, this time Nepal fared better in an indicator, i.e. 'regulatory quality', which it had failed in 2016. Similarly Nepal this time failed the 'Government effectiveness' indicator, which it had passed on 2016 scorecard. MCC uses third-party data such as that from the IMF, the World Bank, UNESCO and UNICEF, among other sources, to come up with its candidate countries for the development assistance. "Any countries that have been selected as eligible to receive [assistance] and a developing country like Nepal which is in the process to develop compact programs has to remain eligible to receive the money every year until the compact program is signed," said Himesh Dhungel, MCC's country director for Nepal, explaining the importance of passing the scorecard to secure the MCC's grant assistance. Countries that want to secure the grant assistance of the MCC must pass at least 10 out of 20 indicators every year, with at least one in each three categories, namely 'economic freedom', 'investing in people' and ruling justly. Similarly, a candidate country must pass the 'control of corruption' indicator to remain eligible for the funding. "There are cases where we have suspended, or even terminated, countries even after signing compact program agreements," added Dhungel. 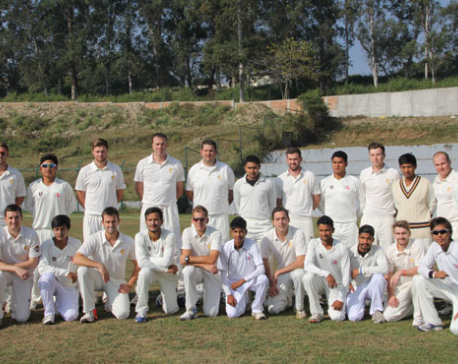 Earlier in December 2014, the MCC board of directors had approved Nepal as eligible for designing and developing proposal for a compact programs for the first time after Nepal consistently passed the scorecard criteria for four years. Eventually, the MCC had provided a US$ 10 million grant to Nepal for the feasibility studies and designing and developing the compact programs. 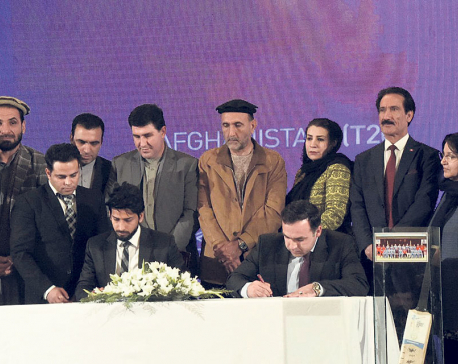 According to the MCC, its grant assistance is awarded to low-income countries and lower middle income countries through competition, as an initiative to reward impoverished countries that follow principles of good governance, economic freedom and investment in people as reflected in the scoreboards. MCC expects the feasibility studies to complete by January 2017 and take the proposed investment program to its board in September 2017. According to Dhungel, the compact projects must be completed within five years of project contract coming into force. "According to the law that created MCC, we cannot spend even a penny after five years. 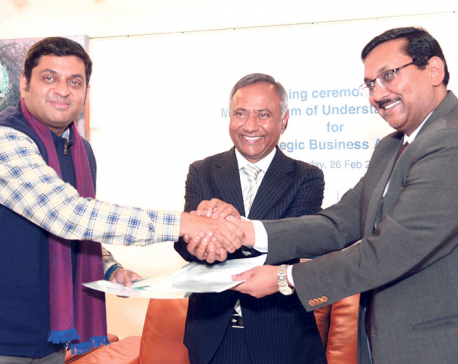 So extending the time and providing additional funds are the two things that we cannot do," said Dhungel. "That means there has to be a lot of discipline while selecting the right kind of projects so that the deadlines are met at any cost," he added. MCC has requested the US Congress to apportion about $300 million for Nepal for FY 2017. However, Dhungel said that the assistance amount would be decided only after the project selection and finalization. The feasibility study is undergoing on projects related to road transport and off-grid electricity projects, according to the MCC.